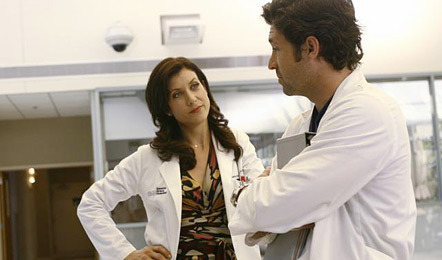 Thursday: Addison Walsh returns to Seattle, but will she stick with "Grey's Anatomy" for good? Plus: What did you think of "The Big 4-0" on Wednesday? On tonight's "Grey's Anatomy" (9 p.m. EDT on ABC), aka the Somewhat Mediocre Show That Millions of Americans Nevertheless Can't Stop Watching, Addison (Kate Walsh) returns to Seattle, presumably after growing weary of all of that sexual tension and New Age nakedness and adorable "Ally McBeal"-style second-guessing out in Malibu. But will she be back for good? "Survivor: Micronesia -- Fans vs. Favorites" features visiting loved ones and more tribal council shockers (8 p.m. EDT on CBS), and then on the conclusion of PBS's doc series "Carrier" (9 p.m., check listings), the USS Nimitz returns home to a few surprises and those aboard look back on their deployment. On "30 Rock" (9:30 p.m. on NBC), Liz's ex Floyd returns to NYC, and Jack falls ill on "Lost" (10 p.m. on ABC). What did you think of the "The Big 4-0" on Wednesday? Go here to discuss. Matthew Broderick, Evan Handler, the latest eliminated celebrity from "Dancing With the Stars"